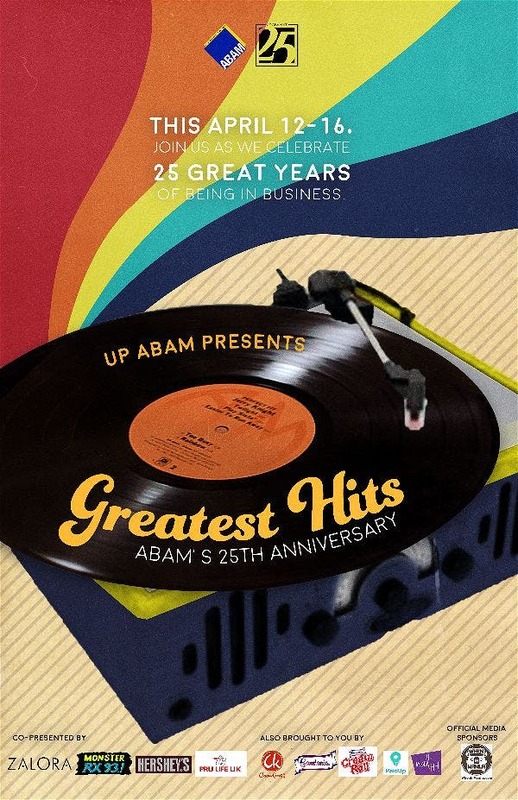 UP Association of Business Administration Majors, ZALORA, Hershey’s, Pru Life U.K., and Monster Radio RX 93.1 present: Greatest Hits: UP ABAM’s 25th Anniversary! Inviting all UP students to join the University of the Philippines Association of Business Administration Majors as they celebrate 25 great years of being in business with a week full of great music, great food, and great lineup of events! Get to know more about the organization by visiting their gallery at the 3rd back lobby of VSB starting April 12. Help a UP student graduate! Donate 130 pesos and get a sunflower with a special dedication in return! Catch us at the AS Walk from 10am to 5pm on April 13! Watch out for us as we parade around the campus on April 14; and don’t forget to pass by the 3rd back lobby of VSB and get a chance to win freebies from our sponsors on April 15! Calling all UP ABAM Alumni! Reminisce our greatest hits in the Playback: UP ABAM Alumni Homecoming on April 16 at Xavierville 3 Clubhouse, Quezon City! Ateneo Scholars’ Week 5 “ELEVATE: Step Up your Game”!